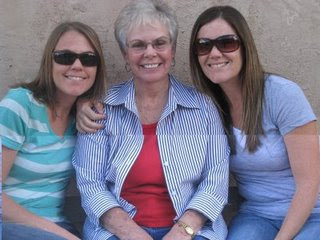 for thanksgiving this year we headed over to tucson arizona to visit with our family. my aunt, uncle and cousins live there. my sister and her family went and so did my mom and my dad. we had a house full of people and it was SO much fun. we had a blast checking out old movie sets, walking around, eating, and watching a ton of shows. this is seth on the hog as he would say. every time the guys got even a little bit bored this where they would turn. they had so much fun riding this little motor bike up and down the block. the boys had fun riding with daddy. on thursday we had an amazing thanksgiving lunch with my uncle's incredible mesquite turkey. my friend salley made this apron special for my aunt. she was so excited and even wore a color coordinated shirt. here she is displaying it proudly. after our meal the boys all got a turn riding bocochullathe wonderfully tame horse. smoosh thought he was a real life cowboy. the next day the girls went shopping and the boys went out to shoot guns. this has been an annual traditon that my boys look forward to every year. another annual tradition is taking a walk to the nearby wash. we usually go after our thanksgiving dinner but it rained this year so we took our walk the next day. the boys like to pretend they are investigators hunting for clues since there are usually tires and even some old cars from when the was gets full from the rains. one year they turned over a tire and found a baby rattler. the good mom that i am ran away terrified and left my three babies there with a killer baby rattle snake. this a HUGE joke in our family and the boys wanted to see me run like crazy again. Luckily they didn't find anything this year. 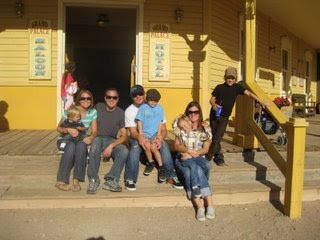 on friday night we went to a cowboy steak house for dinner with the whole family. there is ONE rule at the steak house that says NO TIES ALLOWED, and if you wear a tie they will cut it off. so i brought some ties from home for the boys to wear. smoosh was being a grump so he didn't wear his but isaiah an tan did. this old cowboy guys came over to the table and cut off both of their ties. tan cried even though he knew it was going to happen :) after they cut it off you can staple it to the wall and write your name on it. after dinner we all went to the gunshow. it was a blast spending time with our family. thanksgiving in the desert was awesome! Looks like it was a blast! So cool that you all get to do this every year! Happy Thanksgiving Friends! We had so much fun with all of you, we are blessed to have such a great thanksgiving every year. Love you!